The National Weather Service has issued a winter storm watch from this afternoon through late Saturday night. Heavy snow and sleet are possible with total accumulations expected to be between five to seven inches. Travel may be difficult. We’ll make sure to inform you of the latest Metro Transit operations here, with the newest updates being published first. Metro Transit Information has expanded its hours to better serve customers during this winter storm. You can call 314-231-2345 during normal operating hours (Monday through Friday, 7 a.m. to 6 p.m.), or you can reach one of our transit experts by text at 314-207-9786 until 8 p.m. on Friday and from 7 a.m. to 4 p.m. on Saturday to get the latest transit updates for your commute. Metro Transit Update: Monday, January 14 | 6:45 a.m.
MetroLink has resumed normal operations and experiencing no delays. The #59 Dogtown remains on snow route. MetroBus is on time with no delays. Metro Transit Update: Monday, January 14 | 6:12 a.m.
MetroLink is operating on a single track at the Clayton and Forsyth MetroLink Stations. Riders may expect minor delays at this time. Metro Transit Update: Monday, January 14 | 5:12 a.m. The #59 Dogtown is on snow route. 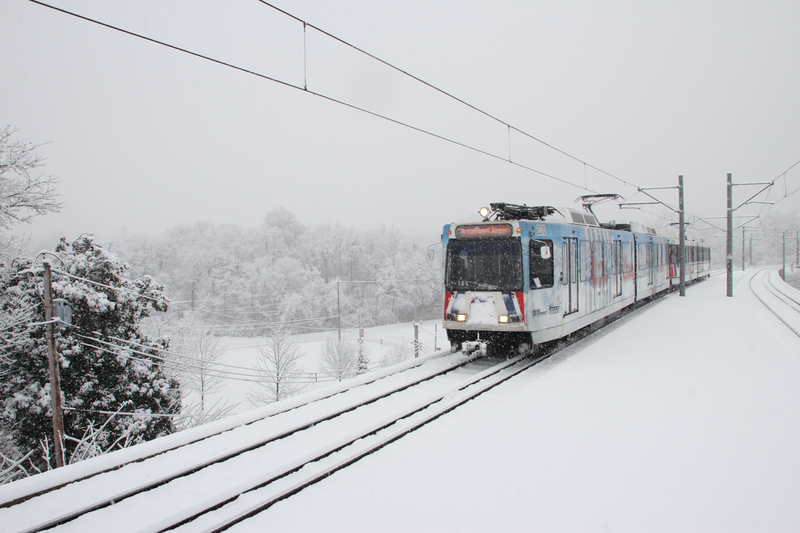 MetroBus and MetroLink are operating with no delays. Please be cautious and allow extra time to get to your bus stop or MetroLink station. Metro Transit Update: Monday, January 14 | 4:50 a.m.
MetroBus and MetroLink are operating normally with no delays. Please be careful of slick spots and allow extra time to get to your bus stop or MetroLink station. Metro Transit Update: Sunday, January 13 | 6:49 p.m.
MetroLink is operating on time without delays. The #59 Dogtown remains on snow route. MetroBus experiencing no major delays at this time. Metro Transit Update: Sunday, January 13 | 9:35 a.m.
MetroLink has resumed service at Terminal 1 and Terminal 2 MetroLink Stations at St. Louis Lambert International Airport and the MetroLink Station Shuttle has been cancelled between the Terminal 1 and North Hanley MetroLink Stations. Metro Transit Update: Sunday, January 13 | 9 a.m.
Due to a fire at St. Louis Lambert International Airport, trains are not serving the airport at this time. Riders wanting to continue west will need to board a MetroLink Station Shuttle at the North Hanley station. Delays of at least 60 minutes are possible in this area. Metro Transit Update: Sunday, January 13 | 8 a.m.
A MetroLink Station Shuttle is in effect between the North Hanley and Terminal 1 MetroLink Stations. MetroLink is not serving St. Louis Lambert International Airport at this time. Riders wanting to continue west to the airport will need to board a MetroLink Station Shuttle at the North Hanley MetroLink Station. Delays of at least 60 minutes are possible in this area. Metro Transit Update: Sunday, January 13 | 7:20 a.m. The #59 Dogtown is on snow route. MetroLink and MetroBus are not experiencing major delays at this time. Metro Transit Update: Sunday, January 13 | 5:30 a.m.
MetroLink is operating on schedule without any delays at this time. MetroBus is operating on schedule without any delays at this time. Metro Transit Update: Saturday, January 12 | 8:09 p.m.
MetroLink is on time, experiencing no delays. MetroBus service is operating normally with no buses on snow routes at this time. MetroBus delays of 10-15 minutes are still possible. Metro Transit Update: Saturday, January 12 | 6:33 p.m.
MetroLink has resumed normal service between the Rock Road and Wellston MetroLink Stations. MetroLink is experiencing no delays at this time. Metro Transit Update: Saturday, January 12 | 6:02 p.m.
MetroLink is operating on a single track between the Rock Road and Wellston MetroLink Stations. Riders may experience 5-10 minute delays until further notice. Metro Transit Update: Saturday, January 12 | 5:27 p.m.
MetroLink is operating on schedule with no delays. MetroBus is experiencing delays of 10-15 minutes or more on some routes. Please allow extra time for your commute this evening. The #99 Downtown Trolley route is discontinued for the rest of the evening, to allow operators to support service on other routes. Metro transit managers will be stationed at the Civic Center Transit Center this evening to assist riders. Metro Transit Update: Saturday, January 12 | 1:48 p.m.
MetroLink is operating on schedule with no delays at this time. Some MetroBus routes are still experiencing significant delays due to road conditions. Text us at 314-207-9786 to check the status of your bus. Text line will be open until 4 p.m.
Metro Transit Update: Saturday, January 12 | 11:03 a.m.
Metro Transit Update: Saturday, January 12 | 8:48 a.m. If you need to travel today (to St. Louis Lambert Airport, downtown St. Louis, etc.) take MetroLink. There are no delays. MetroBus routes continue to experience delays of 15-30 minutes. Metro Transit Update: Saturday, January 12 | 7:30 a.m.
MetroLink is operating normally without delays. Most MetroBus routes continue to experience delays of 15-30 minutes due to road conditions. Metro Transit Update: Saturday, January 12 | 6:28 a.m.
Crews are doing their best to keep Park-Ride lots and MetroLink platforms clear of snow. Please be careful and allow extra time to get to your bus stop or MetroLink station. Metro Transit Update: Saturday, January 12 | 6:19 a.m.
MetroLink is operating normally with no delays. Most MetroBus routes are experiencing delays of 15-30 minutes due to road conditions. There are 11 routes (see below) on snow routes at this time. Metro Transit Update: Saturday, January 12 | 5:02 a.m.
MetroLink is operating on schedule without any delays. All MetroBus routes are currently experiencing delays of 15-30 minutes, and the following routes are operating on snow route: #18 Taylor, #30 Soulard, #33 Dorsett-Lankland, #34 Earth City, #42 Sarah, #59 Dogtown, #70 Grand, #90 Hampton, #94 Page and #01 Main Street-State Street (IL), #17 Carlyle Plaza – 17th Street (IL). Metro Transit Update: Friday, January 11 | 10:38 p.m.
We’ve extended the Metro Transit Information text line to assist riders tomorrow. Text 314-207-0786 from 7 a.m. to 4 p.m. Saturday to learn the latest information on your commute. Metro Transit Update: Friday, January 11 | 10:32 p.m.
MetroLink continues to be unaffected by the weather, operating without delays. All MetroBus routes are experiencing significant delays due to road conditions. Riders should expect delays to continue through the evening until the end of service. Metro Transit Update: Friday, January 11 | 9:36 p.m.
MetroLink continues to operate without delays. MetroBus routes are experiencing significant delays at this time due to traffic and road closures. Metro Transit Update: Friday, January 11 | 8:21 p.m. Significant delays remain on various MetroBus routes due to traffic and conditions on area roadways. All MetroBus routes continue to operate on snow routes. MetroLink is on time and experiencing no delays. Metro Transit Update: Friday, January 11 | 6:52 p.m.
MetroBus continues to experience significant delays at this time as buses are detouring around traffic, hills and other areas with poor road conditions when possible. MetroLink is on time with no delays. Metro Transit Update: Friday, January 11 | 5:52 p.m.
At this time, all MetroBus service is operating on snow routes due to heavy traffic and road conditions, with some buses experiencing major delays. MetroLink is operating normally without delays. Metro Transit Update: Friday, January 11 | 5 p.m.
MetroBus is experiencing delays across the system due to road conditions. The #59 Downtown and #1 Main Street – State Street continue on snow routes. MetroLink is operating normally without delays. Metro Transit Update: Friday, January 11 | 3:41 p.m. The #1 Main Street – State Street and the #59 Dogtown are on snow route. All other bus routes are operating normally. Delays are possible due to road conditions. MetroLink is operating normally without delays. Metro Transit Update: Friday, January 11 | 3 p.m.
MetroBus and MetroLink are not experiencing major delays at this time. Be careful and take your time as you make your way to a MetroLink station or bus stop. Metro Transit Update: Friday, January 11 | 1:22 p.m.
MetroBus and MetroLink are operating normally at this time with no major delays.